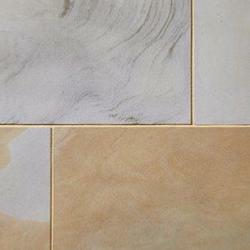 York Mix is a sawn cut sandstone with clean edges and a slightly textured surface. Available in two single sizes, York Mix reflects a look similar to the popular 'YorkStone'. With a striking mix of buff and grey coloured flagstones, all packs should be opened and pieces mixed before installation, to prevent colour blocking and to ensure the desired dual colour pattern that York Mix offers is achieved.